Over the past weeks we have seen the conflict between Israel and Gaza unfold with horror and helplessness. The fighting has ended, but the injured continue to suffer. Whatever our politics, and whatever we think is right or wrong, no one can help but be moved and devastated by the loss of civilian life, and the suffering of the people of Gaza. We are a group of British Jews from different organisations and with different ‘positions’ on the conflict, but with a shared desire to ease that suffering in whatever way we can. We have set up this appeal for members of our community to donate funds to where they are most needed. We must not let empathy be a casualty of this conflict. Where will the money be going? Hundreds of Palestinians wounded in the conflict are being treated in Palestinian hospitals in the West Bank and East Jerusalem. These hospitals are under-provided at the best of times and are now struggling under the additional pressure. The patients who have been transferred from Gaza are struggling with horrific injuries and traumas. Many have been severely burned or disabled; many have had their homes destroyed and have been left destitute. They are separated from support networks and are mourning the loss of loved ones. They are in urgent need of assistance for medicines as well as basic items such as food and clothes. Al-Makassed hospital in East Jerusalem is the principal Palestinian hospital for acute treatment referrals, but as a charity hospital they receive no governmental support and are struggling with a funding crisis made worse by the influx of patients from this conflict. Their doctors have been unpaid for several months, and have already treated over 80 patients from Gaza including many children. There are more patients being transferred from Gaza every day. They desperately need financial assistance to continue this work and to purchase urgent medical supplies for the injured from the conflict – particularly surgical equipment and antibiotics. They are also providing financial assistance to destitute patients returning to Gaza. 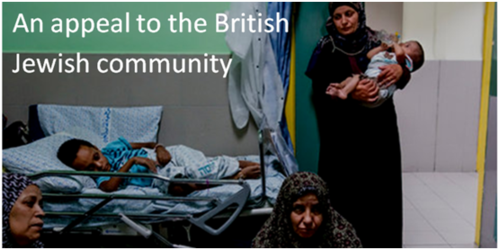 One of our group has recently visited Al Makassed and other Palestinian hospitals with a few donations from us and our families, and the aid from British Jews has been received with gratitude. Can I see more information about Makassed Hospital?